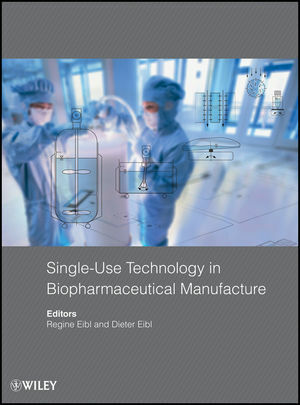 This book gives an overview of commonly-used disposables in the manufacture of biopharmaceuticals, their working principles, characteristics, engineering aspects, economics, and applications. With this information, readers will be able to come to an easier decision for or against disposable alternatives and to choose the appropriate system. The book is divided into two parts – the first is related to basic knowledge about disposable equipment; and the second discusses applications through case studies that illustrate manufacturing, quality assurance, and environmental influence. Regine Eibl is a professor at the Zurich University of Applied Sciences (Switzerland), where she lectures in biotechnology and cell cultivation techniques. Dieter Eibl is a professor at the Zurich University of Applied Sciences, where he lectures in biochemical engineering and the planning of biotechnological production facilities. 1. Single-use equipment in biopharmaceutical manufacture: A brief introduction. 2. Single-use bag systems for storage, transportation, freezing and thawing. 3 Bag mixing systems for single-use. 4. Single-use bioreactors - an overview. 5. Systems for coupling and sampling. 9. Single-use technology for formulation and filling application. 10. Production of disposable Bags: A manufacturer’s report. 12. Biopharmaceutical manufacturing facilities integrating single-use systems. 13. An introduction to the validation and qualification of disposables used in biomanufacture - a user’s perspective. 14. Waste generation, treatment options and the environmental impact of single use systems. 15. Next generation single-use bioreactor technology and the future of biomanufacturing: A summary from manufacturer’s and user’s perspective Single-Use Technology in Biopharmaceutical Manufacture. Part II: Application reports and case studies. 1. Disposable SuperSpinner: Characteristics and typical applications. 2. A new scale-down approach for the rapid development of Sf21/BEVS-based processes - a case study. 3. Practical aspects of establishing pharmaceutical recombinant proteins from research to development in disposable bioreactors. 4. Single-use stirred tank reactor BIOSTAT CultiBag STR: Characterization and applications. 5. Single-use bioreactor platform for microbial fermentation. 6. Growth of BY-2 suspension cells and plantibody production in single-use bioreactors. 7. CFD as a tool to characterize single-use bioreactors. 8. Automated disposable systems: Application reports. 9 New single-use sensors for online measurement of glucose and lactate, the answer to the PAT Initiative. 10. Disposable Chromatography for large-scale biomanufacturing. 11. Single-use virus clearance technologies in biopharmaceutical manufacturing: Case studies. 12. A single-use technology platform for downstream processing: Mobius FlexReady Solutions. 13. The manufacture of MAbs - a comparison of performance and process time between traditional and ready-to-use, disposable systems. 14. Going fully disposable - current possibilities: A case study from Crucell. 15. Production Costs in Biotech Facilities: Single Use vs. Multiple Use Equipment for Antibody Manufacture.